What a challenge the ‘Practical Handbook of Earth Science’ must have presented, but seemingly undaunted the authors have risen to this challenge and we have a handbook that covers (almost) everything in the field of Earth Science. From physical units and constants to the fundamental building blocks of our planet, and how it moves, evolves and influences every aspect of our lives – it is all in there. In one place I can find out how the Earth’s magnetic field works and changes over time, can travel from the core to the upper atmosphere understanding structure, composition and process. You can delve into the detail of rock types, mineral characteristics and properties, and consider how these natural resources are utilised in the modern world. Is this a handy handbook to have when all this information is available at the click of a button on the internet? 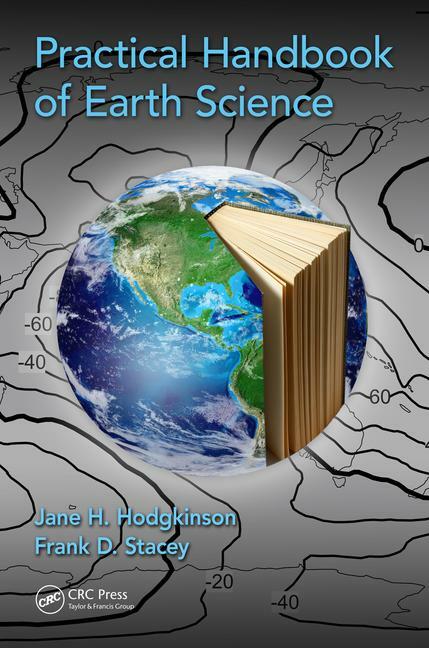 Well yes, it most certainly is, as authors Jane Hodgkinson and Frank Stacey have done all that work for you, carefully sifting and selecting key information which underpins the fundamentals of Earth Science. Often, when you pick up a book like this – facts, lists, and explanations – the temptation is to go to something you know well to test how good it is. So this is where I come to the ‘covers (almost) everything’ observation. Where this book is light in content is palaeontology with the fossil record and geological time being confined to four pages. This seems an oversight given how fundamental understanding geological or ‘deep time’ has been, and is, to understand the evolution and dynamics of the planet. Equally, palaeontology is a critical discipline within the Earth Sciences that enables our understanding of environmental change, the evolution and extinction of life, and crucially in today’s world helping elucidate environmental response to climate change. Whilst I’m here, considering the ‘almost’, faults (but no folds?) have a simple and classic block diagram which helps the reader visualise the narrative but diagrams are largely absent and would have similarly assisted elsewhere. The Handbook ends on a cautionary and prescient note. The last section considers resources: their use, vulnerability and degradation, and the last paragraphs the cautionary problem of plastic disposal which is here considered among the most serious waste disposal problems without a satisfactory solution. And prescience? In the UK in 2018, this challenge has received unprecedented coverage being brought to the fore in David Attenborough’s ‘Blue Planet’ and the subject of an extensive UK Government consultation ‘Tackling the plastic problem’. What you have here is a demonstration of the broad church that is Earth Science and an illustration of the utilisation, both practical and theoretical application, of natural sciences (and mathematics) across its subject. It is clearly and succinctly written and gains a place amongst my reference books. Well done to the authors. Analysis: Nature is worth a lot more than nothing!